Megan and Liz aren’t your average twin sisters. The blonde and brunette BFF’s have been active on YouTube since 2007, singing their hearts out on their channel Megan & Liz, but the 19-year-old up-and-coming pop stars have been singing for much longer. In fact, the sisters have been singing for so long, they didn’t initially realize music was their calling. It felt so second nature to the girls, who say “we’ve always grown up around music, so we never really saw ourselves doing anything else! If there had to be a moment, we’d say it was probably the beginning of our senior year of high school when everyone else was applying to college, and we knew we wanted to give music a try before college.” And the girls are so happy they did pause to work on their singing career. Megan and Liz released their EP “This Time” this past February, which they said was pretty amazing. “The best part [about making the EP] was discovering our sound. The EP is a contemplation of our work and discovering ourselves through co-writers and music over the span of a year, so that was really fun!” This Time has been available on iTunes for download since February 20, 2012 and is jam-packed with seven all-original pop/rock singles. As if you’re not already impressed with Megan and Liz, it gets better! These twins are seriously into style. Megan and Liz have their own beauty channel on YouTube, which they started in January 2011 and have over 100 videos ranging from how-tos to style advice. As it turns out, the girls’ personal outlook on fashion is pretty different! “Our personal styles are a bit different from each other: Megan is more edgy and preppy, while Liz is more boho/hipster.” While their styles may be opposites, their fashion inspiration comes from the exact same place: comfort and self-expression. Through music and fashion, Megan and Liz shine together, but they also shine apart! Both girls have different tastes and are attracted to different styles. They both love fashion and beauty, and at the end of the day, they just want to have fun with their appearance. 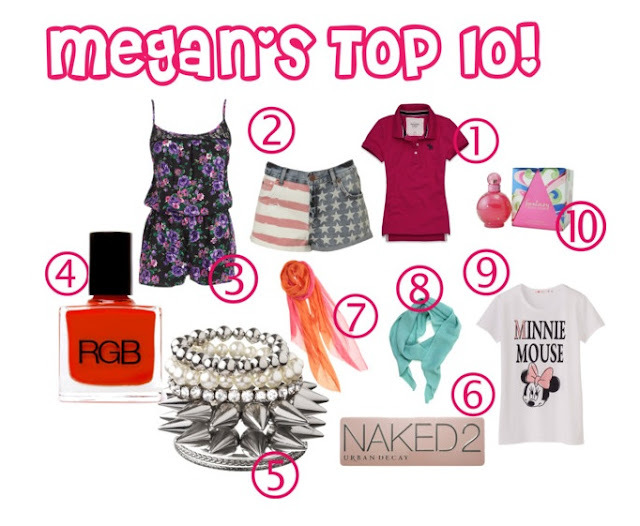 After all, Megan and Liz’s fashion mantra is “Have fun with fashion! Never take it too seriously, and be creative.” They are definitely doing just that! If you could create your own designer label, what kind of clothes would you design, and what would you call your label? M: My style icons are people like Miley Cyrus … she is always so trendy! L: I think Carrie Underwood is a really good example of whom I look to for style. She is always classic and always looks amazing! Do you like to follow trends or make your own? M&L: We do a mixture of both, really. We take the trends and make them our own! M&L: We both love Stella McCartney and Jeffrey Campbell! M: I cannot live without scarves. No matter the season, I still love them! L: I would have to say shoes! I literally have an obsession. On your YouTube channel, you often talk about fashion and beauty tips. What is your number one fashion and beauty tip for summer 2012? M&L: The two biggest trends we have noticed for summer is denim on denim, which is totally cool, we think! Also, the American flag seems to be making its way onto everything, and it goes really well with denim! What celebrities do you think have a great eye when it comes to fashion? M&L: People like Emma Roberts and Chelsea Kane … they are always so fashion forward, but keep it simple at the same time. If you could only shop at one store for the rest of your life, what store would you pick? M&L: We are both crazy about Forever 21 and Urban Outfitters! Does your personal style connect to your music at all? M&L: Yes, for sure! It is different and young! M: I always either go for red or a French manicure. I like to keep it classy! L: I always go for black! M: I love Pink Sugar or Fantasy by Britney Spears! L: Stella by Stella McCartney! I’ve worn it since I was 14. What is one saying you like to live by when it comes to fashion and beauty? M&L: Have fun with fashion! Never take it too seriously, and be creative. Visit iTunes to listen to Megan and Liz’s new single!